I started off with a plan in my head to create a mixed media horse, a little like the dog I did earlier in my blog. So to begin with I found a nice photo I had, and started putting down some paint. It turned out to be a very muted tone horse head, and to give it dimension I added some shadow, just slightly, I then got a little lost in my original intent, as I had not planed the lines and borders I wanted before stencilling in bright tones in a variety of pattern forms. I had left the painting on the side, for a week, looking at it frequently, and decided to leave as is, I did consider adding a more detailed eye, as it had dried to a very light tone, but have now decided it should be left. So it is as in my title a very wishy washy watercolour horse. 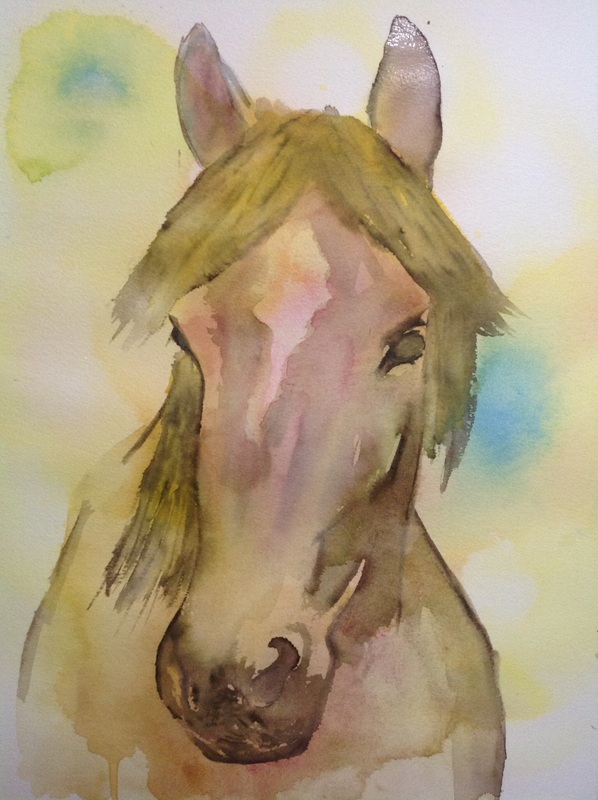 This entry was posted in art, Horse, watercolour and tagged art, Horse, painting, Painting, watercolour. Bookmark the permalink. I think it’s wonderful and horses are tough!! This is beautiful. If it were mine I might punch up the color a bit but I love the shapes! I understand totally, believe me! Love it, I don’t think that it’s wishy washy at all, the muted tones are lovely.